Home >> Latest News >> 33 Year old Speed Queen ® Washes its first load – Perfectly! This is an incredible story which we came across on the Benoni City Times website. It’s yet another testimony to Speed Queen’s durability, robustness and quality construction! The machine, which was purchased in 1985, did its first wash on November 23 2018. 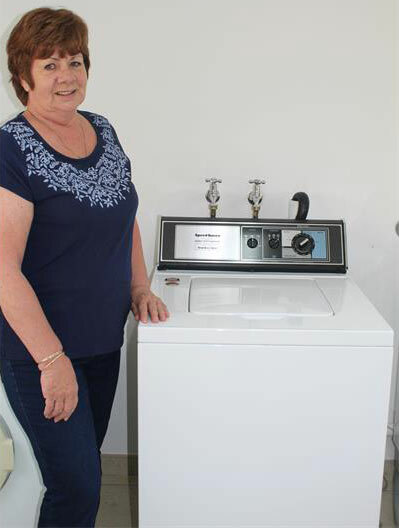 “Oldest brand new washing machine” was the phrase coined by Farrarmere residents Tia Fleischmann and husband Pieter regarding their Speed Queen washing machine. Tia explained that when she first bought the machine she was unable to use it due to space constraints. “When I bought it I thought I’d use it immediately but I had nowhere to put it so we left it aside, thinking it would remain in its original packing for a short while,” Tia explained. However, the short while turned into 33 years later before the heavy-duty washer could make its debut in Tia’s newly-built scullery. “This time we built the laundry room with the intention of having enough space to put the machine in and now we have succeeded in our efforts,” said a beaming Tia. She said the machine, which was purchased at a home appliance store in Boksburg, cost her just over R1 000 at the time. For the inaugural wash, Tia decided to put in her favourite blanket that she had kept aside for the momentous occasion. After installing the machine and waiting with bated breath as the dials were turned and washing detergent was added, the couple was pleasantly surprised with a humming of water filling the drum ready to swish-swash away with the blanket inside. “Of course there’s no guarantee on it but we know the quality of things manufactured back then,” said a laughing Pieter. Tia was happy to report that the machine worked well despite being told by some the machine was too old to work. “My blanket was washed to perfection and I’m so happy to have this machine in use because it’s going to make doing laundry a lot easier,” concluded Tia. We at Lead Household wish the Fleishmanns many happy washes with their ‘brand new old’ machine!